What Does the Cross Mean to You? | God has your back! When the granddaughters come over our afternoons are filled with lots of activity. We generally wind things down by spending some time coloring and drawing. Sometimes I will begin to draw a picture and the girls will try to guess what it is going to be before I am finished. 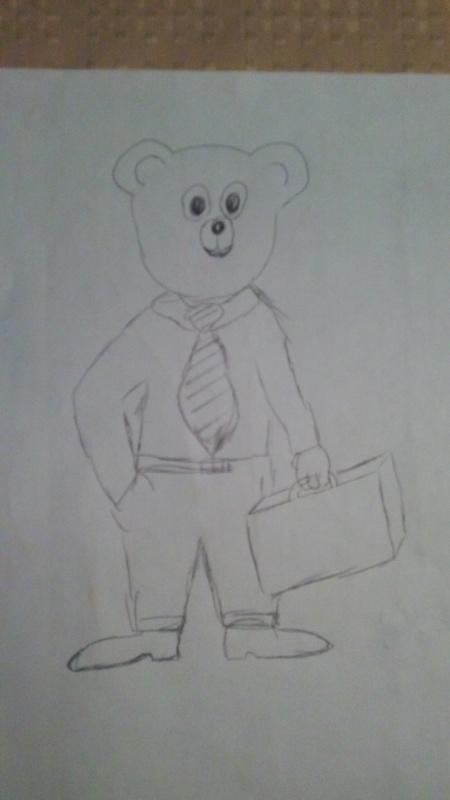 This week I drew a picture of a bear wearing a shirt and tie holding a brief case. When I first started the picture and drew the face, Avery who is 4 was the first to yell, “It’s a bear!” But when I was finished the picture, it was Haley who is two and a half years old who looked at it and said, “Hims going to work.” The images of the briefcase and the shirt and tie meant something to her. She sees her dad wear a shirt and tie and carry a brief case when he goes to work. This bear in my cartoon was decked out in similar fashion so she just knew he was going to work. And she was right, that was exactly what I had in mind when I drew the picture. I love those girls. Images can be iconic. They can convey great and powerful messages. Picture the image of a cross. What thoughts come to your mind? As I thought of it when I sat down to write this devotion, I initially thought of Christ, my Savior subjecting Himself to death willingly and willfully as Atonement for my sin. As Paul said in 2 Corinthians 5:21, “He made Him who knew no sin to be sin on our behalf, so that we might become the righteousness of God in Him.” Yes, the cross reminds me that Christ gave His life for me…what a wonderful Savior we have! But that is not the only image that comes to my mind. When a Christian looks at the image or picture of the cross, if they just see a picture of Jesus as Savior, they are not seeing the full picture. The Bible records in Matthew 16:24 “Then Jesus said to His disciples, “If anyone wishes to come after Me, he must deny himself, and take up his cross and follow Me.” Jesus spoke these words just after He told the disciples that He had to go to Jerusalem where he would suffer many things at the hands of the chief priests and scribes, be killed, and then be raised up on the third day. This did not line up with Peter’s plans or desires so Peter rebuked Jesus and told Him, “No way!” Jesus then told Peter that Peter was doing the devil’s bidding by setting his mind on the desires and will of man rather than the desires and will of God. Jesus then told them that if they wanted to follow Him, they would need to deny themselves and take up their own cross and follow Him. The cross was known to be an instrument of death. The disciples knew that Christ was telling them that they would have to put to death their own desires and wills. To follow Him they would have to forego their own path and submit to His leadership and Lordship. This entry was posted in 2 Corinthians 5:21, Christianity, faith, God, Matthew 16:24, religion, the cross and tagged 2 Corinthians 5:21, Christianity, faith, God, grandchildren, Matthew 16:24, sanctification, take up your cross. Bookmark the permalink.